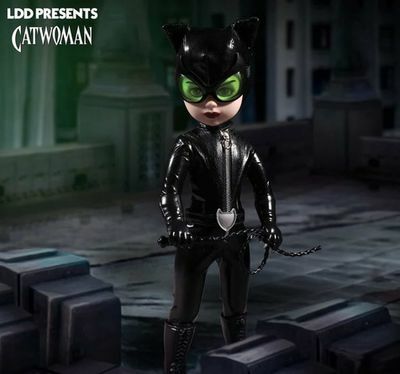 "LDD Presents DC Universe: Catwoman This kitten has claws! Catwoman, also known as Selina Kyle, is known to steal from Gotham City’s rich and corrupt. Do not cross this cat or bad luck is sure to follow. Based on her appearance in the comics, Catwoman is outfitted in a leather-like body suit with a functional zipper. Her belt features a cat-shaped buckle. The furtive femme fatale comes complete with removable night-vision goggles and her signature bullwhip, which she can hold in her hand. 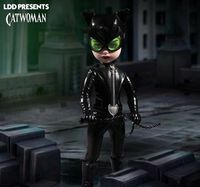 LDD Presents DC Universe: Catwoman stands ten inches tall and features five points of articulation. She comes packed in a window box, purrrfect for display." Legal Notice: Entire contents trademarked (® or TM) and copyrighted (©) 1986-2019 by Things From Another World, Inc. and respective copyright and trademark holders. All rights reserved. Page rendered at 2019-04-20 13:47:37 in 0.480 seconds.